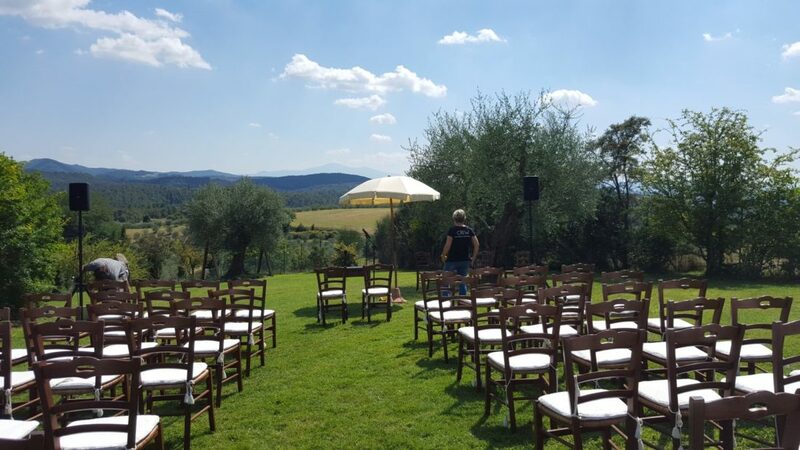 If you are planning a civil wedding in Italy, why not choose to have the ceremony in Tuscany, one of the most picturesque and charming regions in the country? You will discover that there are many beautiful town halls available in Florence, Siena, Lucignano, Arezzo, Pienza – to name but a few of the choices that are available to you. These buildings were often previously used as palaces – something you will not find at home! The town hall in Florence, the Palazzo Vecchio, is an impressive building close to the famed Uffizi Gallery, the Duomo, Florence’s beautiful 13th century cathedral, and the Ponte Vecchio. Civil weddings are conducted in the gorgeous Sala Rossa, or Red Hall, which can accommodate 80 guests, although only 30 of the famous red chairs are available. Weddings may be held here in the town hall on Wednesday, Thursday and Saturday mornings, although civil weddings can usually be performed every day except Sunday in other locations. Music is permitted, so at BeA Alfresco Wedding we can help you in bringing the perfect music. Siena town hall is actually a palace, the Palazzo Pubblico, and has a wedding hall where all of the city’s civil weddings are conducted. The Palazzo has been Siena’s town hall since the 14th century; and with its high carved ceilings and frescoes is a beautiful building in which to hold your ceremony. You and your guests will be stunned at the beauty of the rooms you will walk through to arrive at the wedding hall, which can hold 70 people. Again, music is permitted and the wedding hall is available for civil weddings midweek and at weekends. The beautiful Sala del Maggior Consiglio is the place to celebrate your civil wedding in Volterra. It is located in the oldest palace in the town, the Palazzo dei Priori – which is also the town hall and is one of the oldest in Tuscany. The Marriage Hall, or Council Room, will delight you and your guests with its coats of arms and paintings. Next to the Marriage Hall is the Saletta della Giunta which is also available for your civil wedding. With its 14th century furniture and wooden ceiling this is a dream location in Volterra, in the heart of Tuscany. Weddings are conducted here every day in the morning or afternoon. Above we mentioned just the most famous location for civil weddings in Tuscany, but we will write soon about a number of enchanting, less-known town halls in charming Tuscan small villages. Furthermore, you can have your civil wedding also in some of our wedding venues, as they has been licensed as official locations for civil weddings, which are valid under Italian law. Whether your choice is a luxurious wedding, or a small bohemian wedding, at BeA Alfresco Wedding we will help you in finding the perfect location for you ceremony and your party.